A stolen laptop unleashes a night of terror for a thief and his friends. 2014's Unfriended breathed new life into the found footage horror sub-genre with the novel twist of playing out its drama over the course of a Skype group call, the participants of which were bumped off one by one in classic slasher movie fashion. Like the bathroom of Psycho, the leafy suburban streets of Halloween or the shopping mall of Dawn of the Dead, Unfriended turned the innocuous and everyday surrounds of modern life against us, forcing us to stare at a laptop screen just like those we spend so much of our lives glued to. 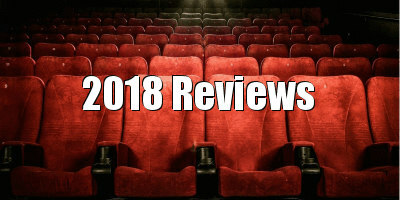 Where the 2014 movie took the classic slasher template of a group of friends paying a deadly price for their past involvement in someone else's death, its sequel, Unfriended: Dark Web, draws heavily from Hitchcock's many obsessions, its protagonists finding themselves unwittingly caught up in a shadowy conspiracy ala The 39 Steps or North by North West. Like Psycho, it opens with a theft, in this case a laptop wrongfully claimed from the lost property section at a cyber cafe by down on his luck twentysomething Matias (Colin Woodell). Figuring out the device's password, Matias begins to load up his own apps, including one designed to help him communicate with his hearing impaired girlfriend Amaya (Stephanie Nogueras). As the two converse over facebook chat, Matias begins to receive messages aimed at the laptop's real owner, who appears to go by the name of Norah C. IV. Most seem to be from women looking for money, but then Norah herself begins to send angry texts demanding the return of her laptop. Thus begins an evening of terror that will involve not only Matias and Amaya, but the group of friends who have joined them on a group chat. 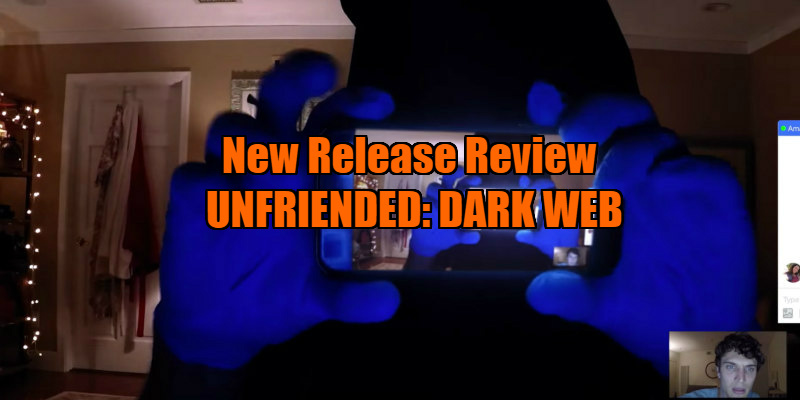 Just like its predecessor, Unfriended: Dark Web takes what seems like a creatively stifling premise and manages to use such limitations as a means of generating suspense and tension, along with informing us about its characters. Director Stephen Susco doesn't have much screen space to work with, so little details like the backgrounds glimpsed behind his characters' heads are used to fill in blanks. We can tell for instance that Matias is struggling compared to his friends, because behind his head is the shabby surrounds of a sparsely furnished bedsit, while his more successful friends live in trendily decorated abodes, save for conspiracy theorist AJ (Connor Del Rio), who lives in his mother's basement. Like Hitchcock's Rope, the film plays out not just in a limited space, but in real time, and it's a testament to the filmmaking on display that it's only after leaving the cinema that I began to think about how difficult it must have been to stitch all the film's elements together to create the illusion of an unbroken 90 minutes on a character's laptop screen. From Rear Window comes the aspect of voyeurism, and like Jimmy Stewart's wheelchair bound peeping tom, Matias finds himself forced to watch from afar as his loved ones are threatened by a menace he's powerless to stop. Thanks to the huge profit margin on relatively miniscule budgets, the Unfriended series will likely live on past its sell by date, but two instalments in, it's the most innovative and effective horror franchise since Final Destination. What holds it back from greatness is its human factor however; for all its technical skill and storytelling virtuosity, it's a series that's yet to give us genuinely sympathetic protagonists we can get behind and root for in the face of its technological terror. 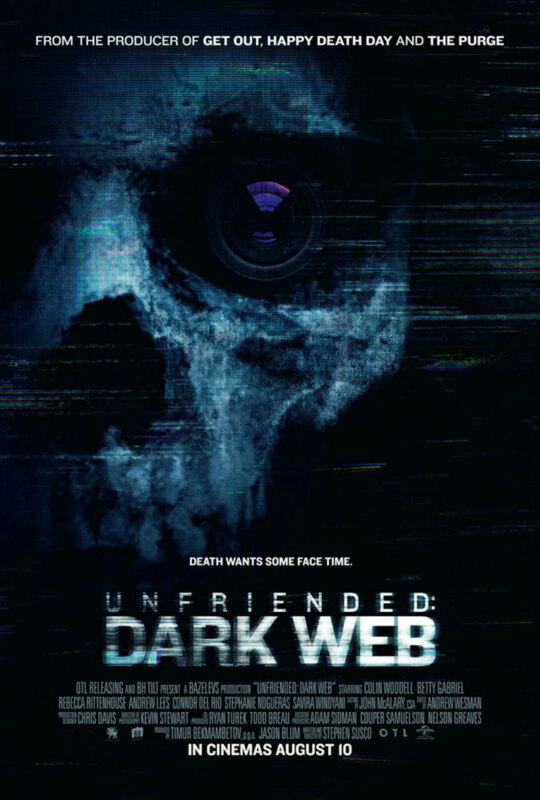 Unfriended: Dark Web is in UK/ROI cinemas August 10th.